Want more space? 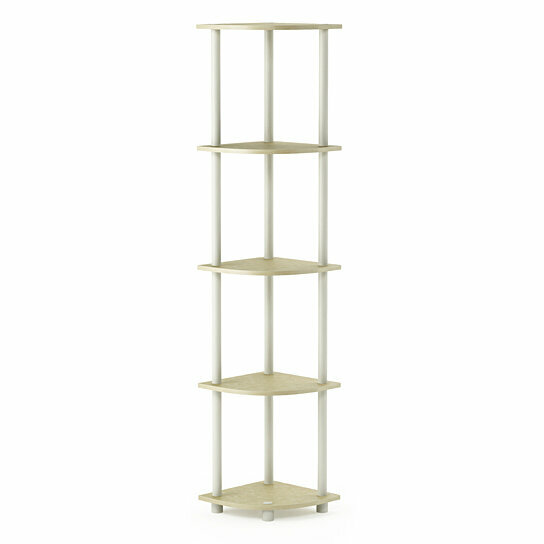 Do not let another corner go to waste with this lovely Furinno Turn-N-Tube Corner Shelves! Simple yet sophisticated, this sleek design can blend in with a variety of ensembles. The three-beam frame gives this design a sleek look, while the wood-style shelves add a touch of traditional flair. Featuring five open shelves for all your needs and the corner design for save space. Furinno Turn-N-Tube Corner Shelves do not need any tools to assemble. Just repeat the twist, turn and stack mechanism, and the whole unit can be assembled within 10 minutes. Experience the fun of D-I-Y even with your kids. A simple attitude towards lifestyle is reflected directly on the design of Furinno Furniture, creating a trend of simply nature. Care instructions: wipe clean with clean damped cloth. Avoid using harsh chemicals. Pictures are for illustration purpose. All decor items are not included in this offer.